New Black Sun Ensemble CD Available for Mail Order! 20 years down the track from their debut and the Black Sun Ensemble have come full circle, presenting a pristine, wholly instrumental and semi-acoustic work that recalls their legendary LP debut. What started out being a side project between Black Sun Ensemble guitarist/founder Jesus Acedo and multi-instrumentalist Eric Johnson, "Across the Sea of Id: The Way to Eden" has become the final collaborative project of new material from Black Sun Ensemble involving Tucson’s Sun Zoom Spark members and their collective, SlowBurn Records. 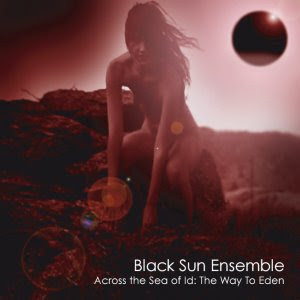 In fact, "Across the Sea of Id: The Way to Eden" maybe the final Black Sun Ensemble record. After completion of the recording, it remains unclear if Jesus Acedo will choose to continue with music. Because of this, "Across the Sea of Id" may be the capstone of a nearly 25 year career that has created some of the most unique rock music of our time. After recording over three hours of material for the project, BSE chose songs that created a rich blend of past and new works. The material, all penned by Acedo and arranged by Johnson, ranges from not only engaging retellings of early work like the majestic Blues for Rainer and a definitive version of the medley Sky Pilot Suite, but also offers a trance-inspired version of St. Cecilia and a more subdued Baphomet’s Curse from "Bolt of Apollo". However, it is the new material that offers a singular, dreamy vision of BSE’s potentially final works. The two title tracks, Across the Sea of Id and Eden Song, are reflective, yet hallucinatory explorations into Acedo’s unique compositional and melodic sensibility. While Angel de la Guardia has a refined yet explosive rock swagger, it is balanced by the meditation Perelandra and La Paz. "Across the Sea of Id: The Way to Eden" was recorded and mixed by Eric Johnson at Tucson’s SlowBurn recording studio and was mastered by John Axtell at Signal House Studio. The art for the album was created by BSE percussionist, John Paul Marchand. It's an enhanced CD, featuring a music video directed by John Paul Marchand of BSE’s signature Dove of the Desert, recorded live on radio station KXCI 91.3FM, Tucson. Paypal (use the US$ option), Direct Debit, Bank Deposit (use the AU$ option).